CHANTILLY, Va., Jan. 22, 2019 /PRNewswire/ — Corbett Technology Solutions, Inc. (CTSI), a systems integrator, is pleased to announce their Subscription Services Portfolio including their AV-as-a-Service (AVaaS) offering. Bridges Inc., a leader in the field of cyber security, was among one of the first clients to implement CTSI’s AVaaS. With AVaaS, Bridges deployed the latest workplace technologies including Panasonic’s professional displays and laser projectors, without any capital investment. In Spring 2018, Bridges, Inc. moved to their new headquarters in Hanover, Maryland. This location was designed to foster collaboration, engagement, and innovation. Bridges was looking to integrate AV solutions that would enhance their innovative culture and environment by providing areas for people to congregate, brainstorm and collaborate. 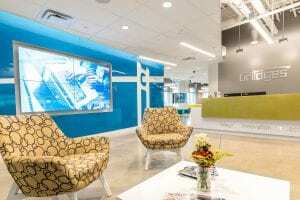 the title of “Cool Digs” by the Baltimore Business Journal. Connect with us: LinkedIn, Twitter or please visit www.ctsi-usa.com. passion to make a positive impact.